What Effect Do Mirrors Have On Animals? When horses are stabled alone, a small percentage of them are prone to a behaviour known as ‘weaving’. This is a series of actions such as the side to side swaying of their necks, forequarters and even their whole bodies. This behaviour is generally thought to be borne of the social frustration brought on by loneliness, and horse owners hate it for several reasons; they believe it causes fatigue, weight loss, and uneven muscle development – it also looks pretty disturbing. For a long time, people hoped that they could stop this ‘weaving’ by installing metal bars in stables, to limit their horse’s movement, however, a study in 2002 of six horses known to be ‘weavers’, found that most of the installation of a mirror almost completely curtailed the behaviours synonymous with ‘weaving’. A later study went even further and discovered that a mirror would work just as well as the presence of another horse. 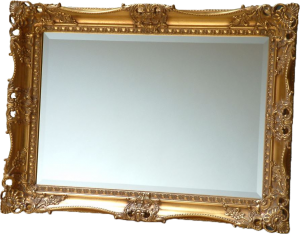 Over the years scientists have carried out a variety of studies on the effects mirrors have on the lives and behaviours of animals. 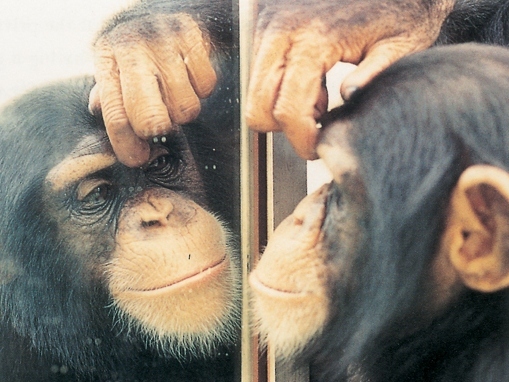 Mirrors have been proven to improve the lives of numerous animals, from labs, farms, zoos and even pets. Cows and sheep that are kept in isolation have been shown to present lower stress reactions when mirrors are around. Monkeys, both in groups and alone, display increases in social behaviours like grimaces, teeth chattering, lip smacking and threats when mirrors are placed around them. Mirrors in birdcages have been proven to reduce some birds’ fear and lab rabbits that are housed alone have been shown to be more active with the presence of mirrors. Animals have very different experiences with, and reactions to, mirrors when compared to humans. The predominant scientific opinion is that most species don’t recognise themselves in a mirror; that is to say, they don’t understand that their reflection isn’t another animal. The only known exceptions alongside humans are some varieties of great ape, dolphins, elephants and magpies – all of whom display very high levels of intelligence. 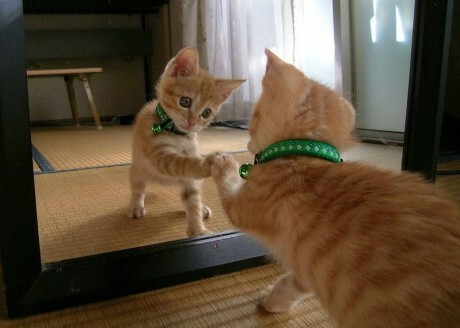 A scientist by the name of Gordon Gallup invented the test that shows whether an animal recognises itself in a mirror. He marked the faces and ears of primates with dye and watched whether they used the mirror placed before them to investigate the spots. If they did, it revealed that the animal understood that it was their face they were seeing in the mirror. 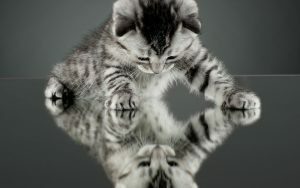 The experiment left Gallup with the opinion that most animals probably think that their reflection in the mirror is another animal. It does, however, seem that some animals are intelligent enough to realise that there are differences between a real animal and their own reflection, even without necessarily recognising the reflection as themselves. In the mirror, animals have no smell, make no sound and also have no bodies; allfairly obvious to us, but a significant step for an animal. Researchers have regularly used mirrors to test the aggression levels in fish. This is because fish are among the creatures that react with fear to their own reflections. A study published in May this year discovered that two of three cichlid species tested exhibited differing responses to their reflections than to another live fish. A further study discovered that differences in brain gene expression levels were dependent upon whether fish were meeting their reflection or another fish. The authors of the study believed that the fish were obviously recognising something unusual about the mirror image and believe that the differential brain response was reflective (excuse the pun) of a cognitive distinction being apparent. Whatever it is that animals do conclude about their reflections, mirrors can sometimes lead to bizarre (and often amusing or unhelpful) behaviours. Many bird owners have noticed that their male birds are particularly enamoured with their reflections, often ‘mating’ with them and continually masturbating in front of mirrors around them. This ‘mate in the mirror’ can also stimulate females to lay eggs, which can be dangerous due to the depletion of calcium and thus brittle bones and health issues it can cause. Birds that bond in pairs, such as budgies, may bond with their reflection and snub their owners. Mice and other rodents tend to feed less around mirrors – indicating that mirrors may not be their ideal companions either. 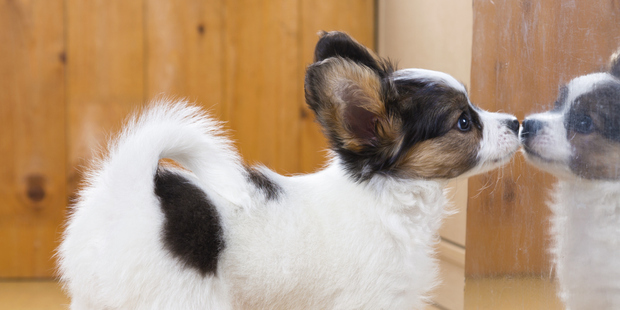 Reactions are diverse in dogs and cats. The first time they see a mirror can be particularly amusing, with the young animal trying to play with, run away from, or fight its reflection and generally ending up completely disorientated. In general, most dogs will eventually avoid or ignore their reflections, some do, however, continue to growl at their reflections for their whole lives. Cats, though, often continue to be entertained by their reflections, performing and preening in front of mirrors, making it seem like they do learn to recognise themselves even after their initial failure to. 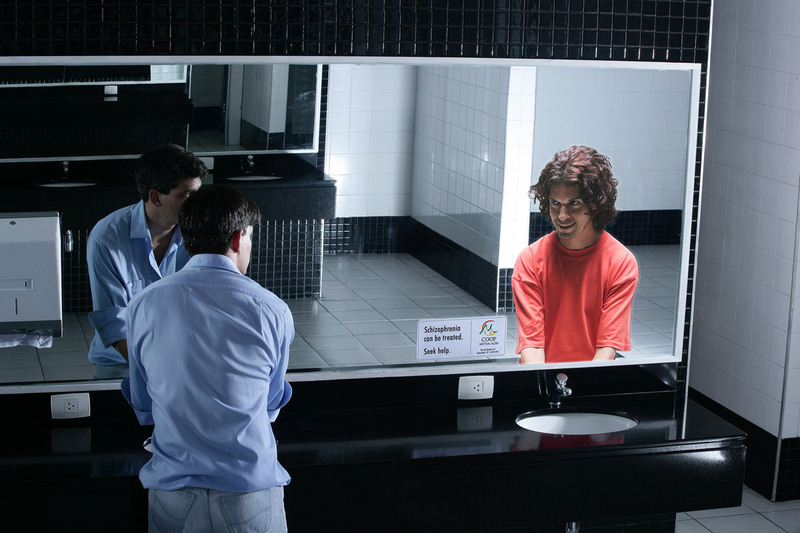 Despite providing enjoyment and comfort, mirrors alone are obviously not enough to keep most social animals happy. The most poignant example of this is a study of young monkeys that were raised with only mirrors for company. Not unexpectedly, the monkeys demonstrated an unhappy mix of autoeroticism, self-clasping, stereotypy and bizarre posturing – behaviours known as isolation syndrome. The same would also be true for isolated cats, dogs, birds and other pets. If you’ve got one, you know; they accept no substitute for the person that you see in the mirror. 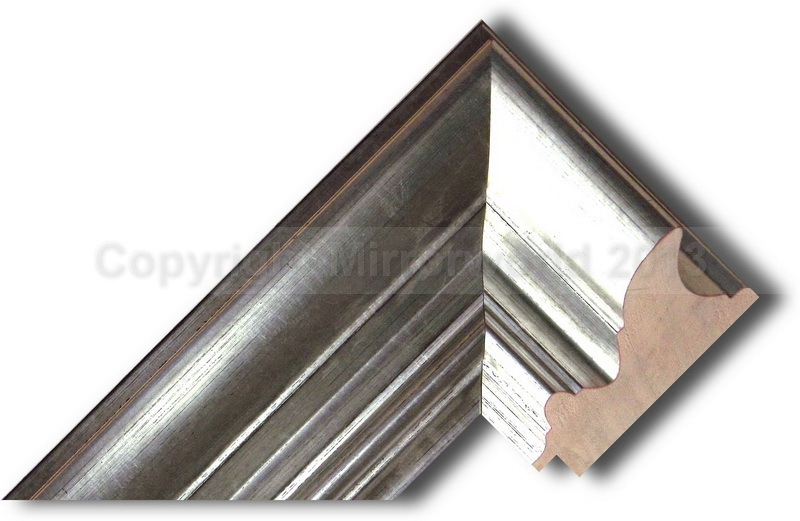 Here at Mirrorworld it isn’t unusual for us to get asked to provide really massive mirrors. And that’s just what one of our regular customers, Dawn Pirie of Inara Interiors asked us for when she was charged with the design of The Terrace Suite at the Sands Hotel in Margate. 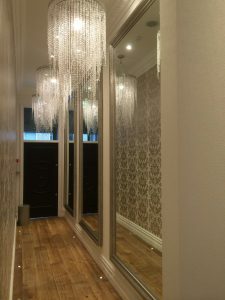 As we always endeavour to put as much love and craftsmanship into our mirrors as Inara Interiors put into their interior designs; when the two are put together, the results are immaculate – certainly worth shouting about. If you need mirrors of a similar size, don’t hesitate to get in touch with us, we’ll provide you with the perfect mirror in any size, to fit perfectly in any location and in any design. 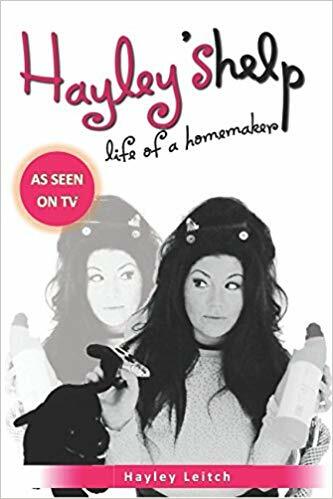 Reality TV Star Hayley Leitch from tv shows Move with Me and Obsessive Compulsive Cleaners has started her new You Tube Channel called Hayley’s Help. In the video on the link below, Hayley talks about her lovely new mirror that she got from us for her hallway. 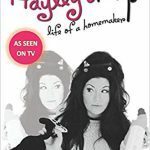 As a special thanks to Hayley for giving us a mention we are giving all her followers and anyone watching the video access to a limited discount code which will give you 15% off your next mirror. Five Mirrors that will make your home look stylish. 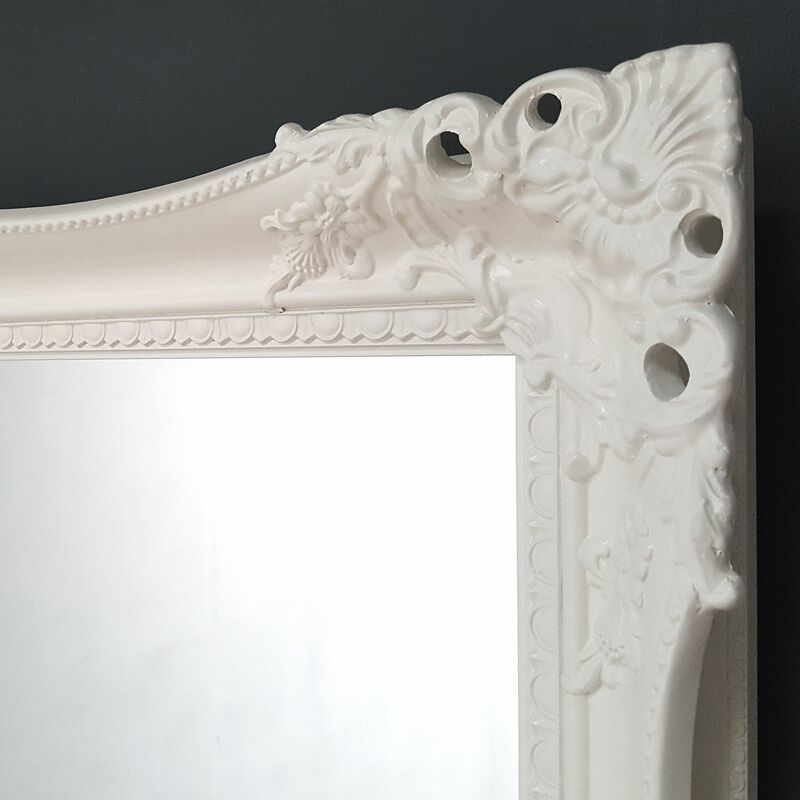 Home retail stores up and down the country, love to sell modern and contemporary mirrors but this doesn’t mean there isn’t a place for more Traditional Antique Styled mirrors. 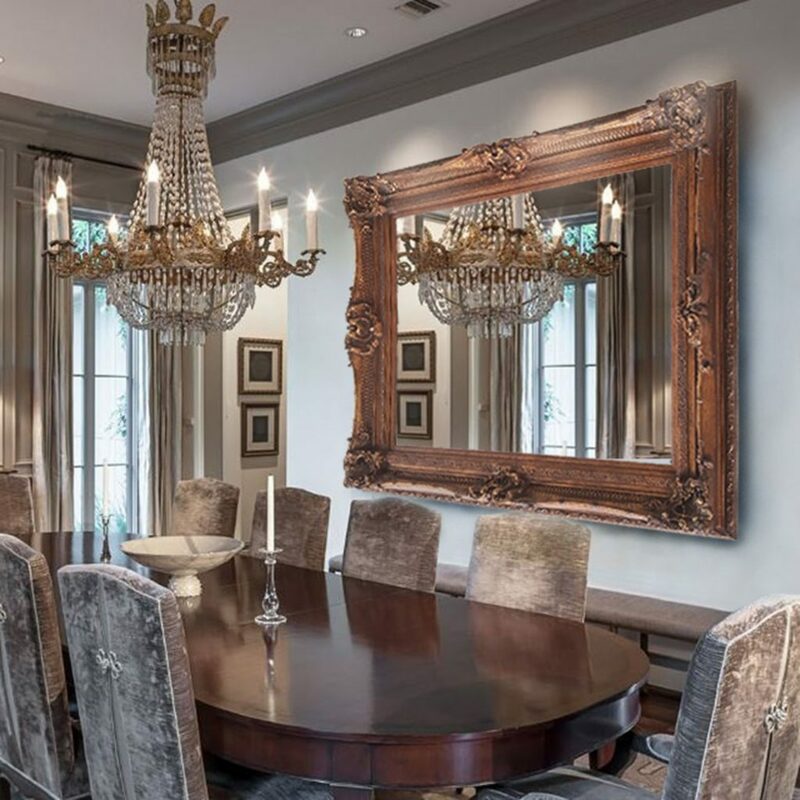 Antique styled mirrors are very seductive. 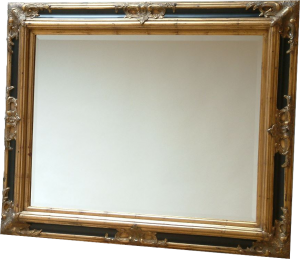 Placing one in a room setting traditional or modern can create an elegant and stylish focal point to a room. It can soften a room and add a romantic aura. 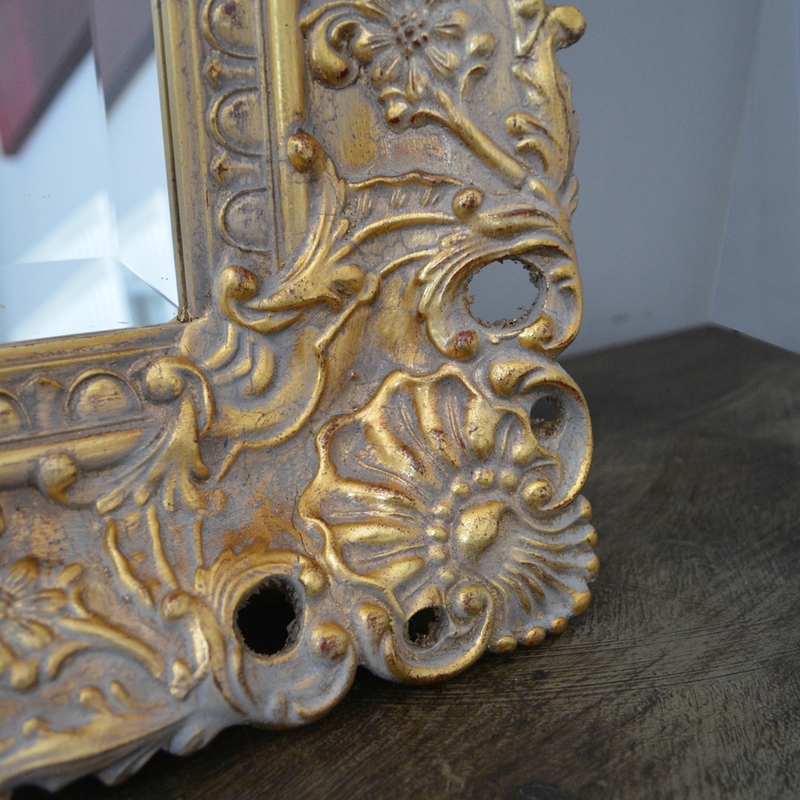 Here are five of our favourite Antique styled Mirrors. 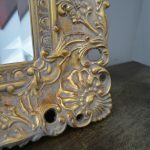 This Very Large Gold Rococo styled framed mirror with intricate detailing and scrolling combines massive proportions with an elegance rarely available in modern home furnishings. The photograph cannot capture the grandeur of this very large mirror that can create a wow factor in any room setting. 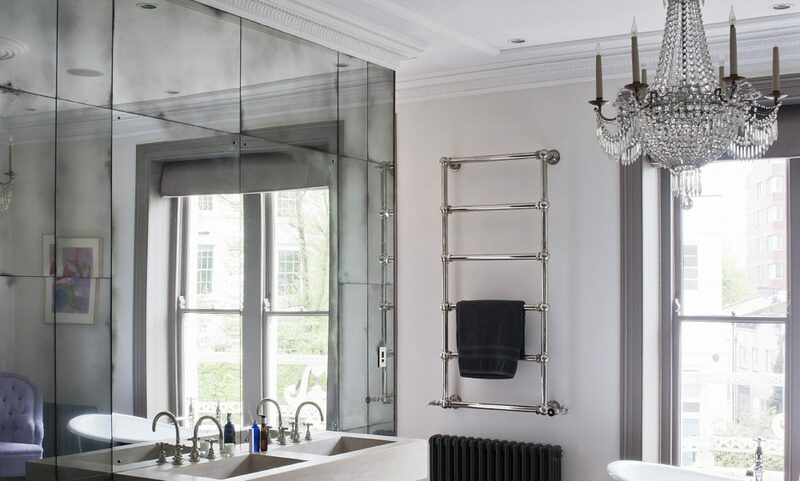 Unashamedly classical and is perfect in a traditional environment however recently it is has been used to add genuine drama and glamour to the most contemporary of interiors. 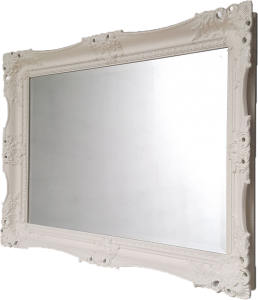 This mirror draws you into a room and can be fixed to a wall or informally positioned on the floor and used as a leaner mirror. 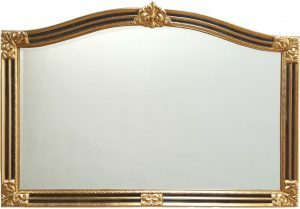 Famous celebrities and interior designers have also used this mirror for their dressing rooms. One of the few mirrors that would not look out of place in the grandest of settings, whether that be a stately hall or Art Gallery. 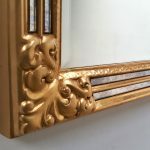 Stunning Decadent Gilt leaf gilt leaf overmantle frame with antique silver glass edge and bevelled plane mirror glass inner panels. 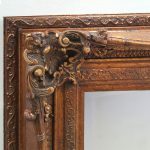 This Gilt-Leaf Overmantle with antique mirror edging is a wonderful choice for the living room hung above the mantlepiece, its French style antique glass border perfectly blends the union of the frame to the main mirror and complements this imposing mirror. 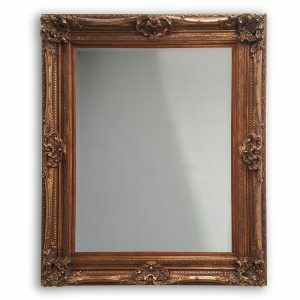 You can almost imagine the aged mirror holds untold secrets from the past. This popular choice amongst those with a more classic interior. 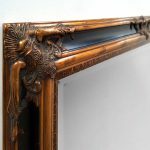 The gilt frame has been gently distressed to age the appearance of the piece, leaving you with something that looks like it has been perfectly preserved over hundreds of years, which makes you want to have it in your possession for a couple of hundred more. 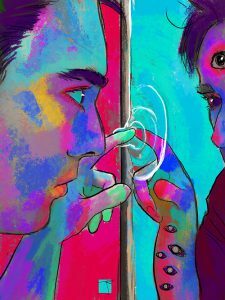 Is what you see in the mirror always there? 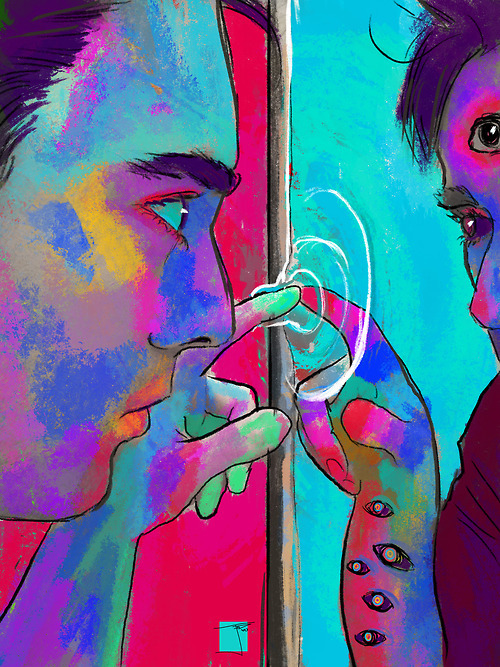 Mirrors can cause hallucinations. The old Halloween trick of staring at yourself in a mirror until a weird illusion is created is beginning to be investigated by scientists. When sitting in a dark room, gaze at your face in a mirror from around 3 feet away, keep staring at yourself for about 10 minutes. At first you’ll find small distortions in your face, then, you will gradually begin to see more dramatic changes – you may begin to look like a waxwork, or like your face doesn’t belong to you, you may see a series of faces, or the faces of fantastical monsters or creatures staring back. It is this dissociative state that scientist are investigating to try and discern more about our sense of identity. Psychologists believe it may even help schizophrenics to be made to confront their ‘other selves’.